Opening a cafe requires a lot of dedication and careful planning. Of course, finding the ideal coffee recipes that will make you stand out is incredibly important for your success, so it’s only logical that you’ll want to focus your attention on assembling the perfect menu. However, don’t let seating end up on the bottom of your list. You can have the best tasting drinks, but if people feel uncomfortable lounging at your place, you might as well close up immediately. It’s a fact that how your seating arrangements look and feel can make or break your establishment. We’ve all been to a place where we felt like there was something off with the ambiance, and left only to never return again. You can make sure this doesn’t happen that often with your cafe by making choices which are carefully thought out. First of all, think about the experience you want your customers to have. Are you planning to just host quick coffee breaks? If so, bar stools with or without backrests combined with tall tables are a very smart choice. On the other hand, if you want your customers to settle in and spend an hour or two at your place, commercial cafe chairs with armrests will be the most comfortable and suitable for this. Try to put yourself in your customers’ shoes and predict their needs. Another important thing to consider is theming. Theming is closely connected to branding – it’s what will set your place apart from other cafes. Plus, adopting a particular theme can make your place attract a certain type of people. The seating needs to work cohesively to capture a certain look and atmosphere. For instance, if you’re planning on adopting a modern, minimalist look, consider purchasing all white, or all black chairs. For a classic/earthy theme, a la bistro, consider using ash timber chairs, rattan chairs, or any kind of dark coloured wooden chairs. Some leather here and there will only add to the earthy, warm effect. Also, think about how much space you have available. Many cafe owners make the mistake of including far too many chairs because they think the more the better. But, your guests would want to have their privacy and nobody enjoys sitting down for a coffee while being able to overhear conversations from the next table. When you include less seating options, you can spend more of your budget on quality. 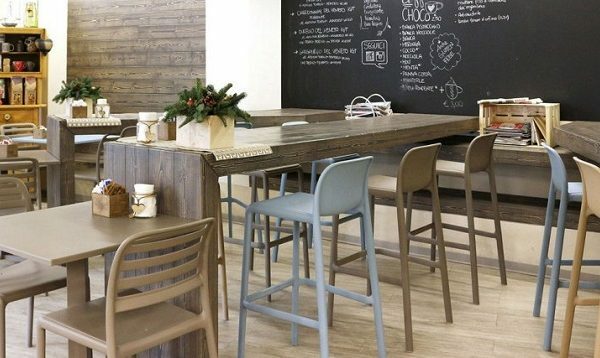 Commercial cafe chairs and tables made of strong woods and metals can prove to be more cost effective in the future. Finally, consider the environment where you’ll place your furniture. If the cafe is completely indoors, you have the freedom to choose any material you like. 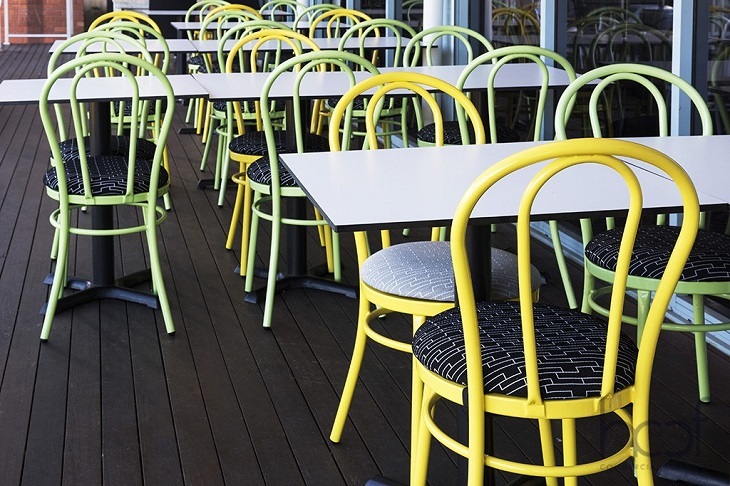 If you’re operating partially or wholly outdoors, then it’s a good idea to invest in chairs made of materials which are UV resistant and can withstand weather elements like wind and rain. Make sure to get informed about the materials and the construction of the chairs. After all, running a cafe is not something that will last only a few months. If you plan it right, that is.